A couple years ago, I walked out of a meeting with DeveloperTown Founder/Partner Michael Cloran with my head about to explode (he’s one of the smartest people I know and quickly discovered that in order to absorb and follow his mental processes I need to toke up on dark chocolate and green tea about 30min prior for maximum absorption) and as I walked out of their building, I saw the mental balance I was needing after my meeting: art. Specifically, the Love Train mural created by the Department of Public Words along the Monon Trail between 52nd and 54th street. I breathed deeply, walked toward the long mural, reading all sorts of amazing messages of positivity that adorn it. 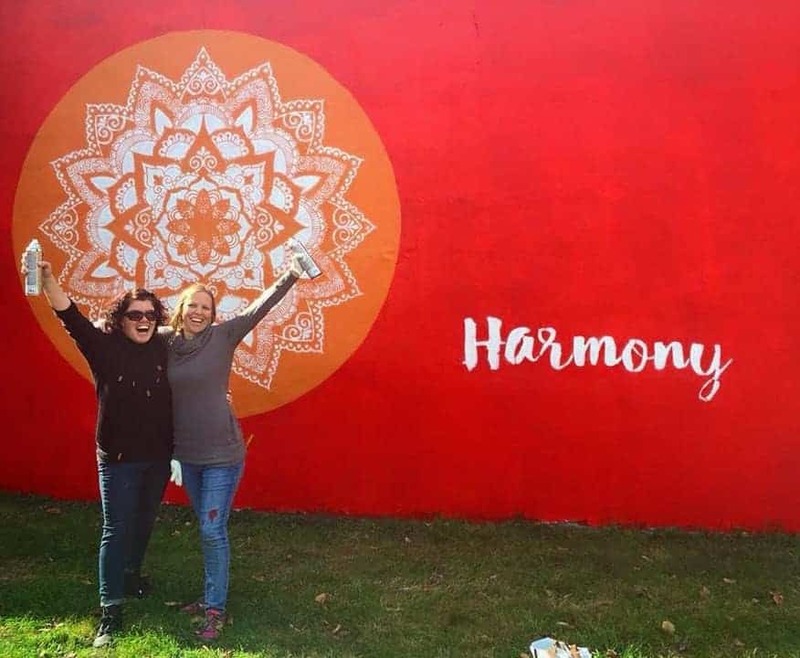 Over 270 positive phrases are shared along the 600’ mural, which required 300 volunteers to create. Megan Jefferson, one of the members of the Department of Public Words, was out that day with her stencils, spray paint and her boys, adding wheels to the freight cars. Megan is a compliment to her partners and DPW Founders, Dave and Holly Combs, who also fall into the “favorite people on the planet” category. Holly, Dave, and Megan are all equally gifted and talented in their own artsy super hero ways. Each are funny, brilliant, amazing, loving, and artistic beyond comprehension. Holly has a TEDx Talk on How Stickers Saved Her Life. While Holly was making dinner one night, she was interrupted by her son who wished to share something with her. He drew a picture and wrote the words “I love you!” on the page and told Holly that people don’t hear this enough. So Holly and Dave made 100 stickers with “I love you” on them and let their kids pass them out. Holly and Dave are legendary for their “ban comic sans” campaign. The best video depicting them on this topic is on the Huffington Post Influential Innovators site. DPW is probably best known for their YOU ARE BEAUTIFUL sign atop the Murphy Building in Fountain Square. One day the Combs family was driving along 10th and Rural and Holly looked up and asked Dave to stop the car. She had an overwhelming feeling to paint “you are beautiful” atop a building immediately…like NOW. Holly knew that inner voice and listened. Dave went to buy a gallon of green paint while Holly walked inside to get permission from the building owner. The owner not only granted permission, he helped. Holly smiled and said, “yes”. He then shared that a couple weeks ago he was heading home to end his life and got off the bus at the corner of 10th and Rural and looked up and saw the sign “you are beautiful” and it gave him the courage to make it through his healing ordeal with having one leg amputated and one in a cast. It gave him hope that he was valuable and pushed him through feeling sorry for himself. Holly, Dave and Megan don’t know all of the stories of the positive impact of their work, but they’ve heard enough to know that they are validated: what they are doing is important and impacting lives. “Words are our most inexhaustible source of magic.” – Albus Dumbledore, Headmaster of Hogwarts School of Witchcraft & Wizardry.